The sections of bone, muscle and cartilage all functioned normally when implanted into animals. The breakthrough, published in Nature Biotechnology, raises the hope of using living tissues to repair the body. Experts described the technology, developed in the US, as a “goose that really does lay golden eggs”. The idea of placing individual human cells in a precise pattern to replace a damaged jaw, missing ear or scarred heart muscle holds much promise. But the field has been limited by the huge challenge of keeping the cells alive – they become starved of oxygen and nutrients in tissues thicker than 0.2 millimetres. The Integrated Tissue and Organ Printing System – or Itop – combines a bio-degradeable plastic which gives the structure and a water-based gel which contains the cells and encourages them to grow. When the structures were implanted into animals, the plastic broke down as it was replaced by a natural, structural “matrix” of proteins produced by the cells. Meanwhile, blood vessels and nerves grew into the implants. Prof Anthony Atala, the lead researcher, said tissues could now be printed on a human scale. While the implants have the same strength as human tissues, the researchers are now waiting to see how durable they are. But Prof Atala said 3D printing was opening new doors for medicine. He told the BBC News website: “Let’s say a patient presented with an injury to their jaw bone and there’s a segment missing. Similar techniques in which the biodegradable scaffolding is built first and then soaked in cells are already being used in patients. Women were given lab-grown vaginas at the Wake Forest centre two years ago, but the range of treatments is again limited by keeping the cells alive. Prof Atala added: “In this study we printed a wide range of tissue strengths – from muscles as a soft tissue to cartilage and bone as a hard tissue showing a whole range of tissue strengths is possible. “The hope is to continue work on these technologies to target other humans tissues as well.” And ultimately they aim to print directly into a patient. 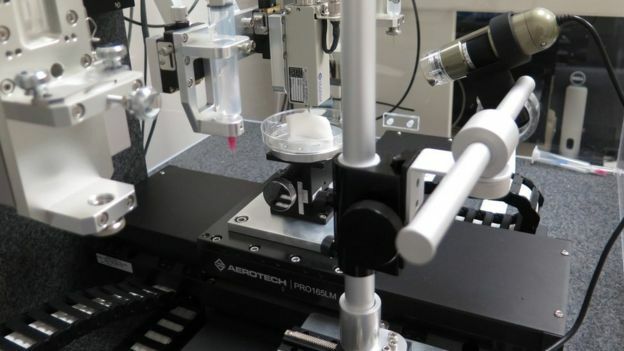 The 3D Printer that was used in printing the human cells. Prof Martin Birchall, a surgeon at University College London, said the results were “striking”. He told the BBC: “The prospect of printing human tissues and organs for implantation has been a real one for some time, but I confess I did not expect to see such rapid progress. “They have managed to create what appears to be the goose that really does lay golden eggs!” He cautioned there was still more research to be done before the printer could be used in patients.